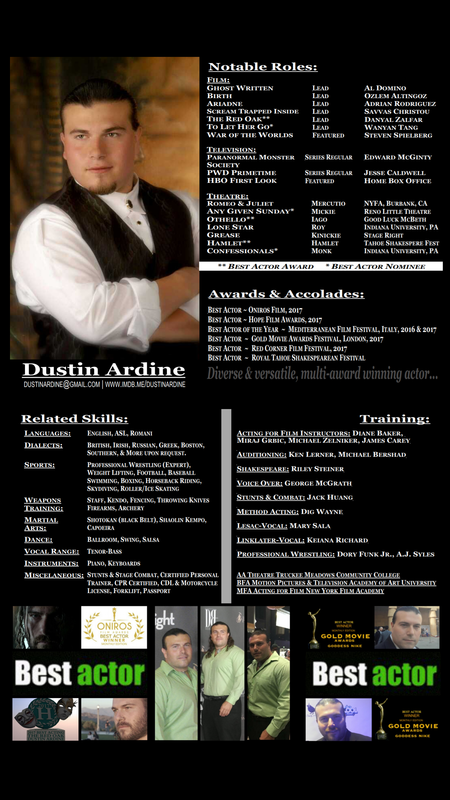 Multi-Award Winning Actor Dustin Ardine. I discovered my love for acting at only 6 years old, when I was picked out of a crowd to be a cast member on "The Star Trek Adventure" at Universal Studios and have been acting ever since. I started performing in musicals and theatre shows in school and with local acting companies. My thirst for knowledge and drive to be the very best actor I could be lead me to study the history of movies and television, famous actors and actresses from around the world, and all the greatest industry teachers. I studied at the renowned Academy of Art University under the tutelage of Hollywood leading lady Diane Baker, and at the famed New York Film Academy in Los Angeles. I have strived to always play a vast array of character and leading roles from Shakespeare to Tennessee Williams, in repertory theaters across the USA, as well as TV shows, Commercials, and Independent films getting my first lead role in a feature film was at the age of 21. 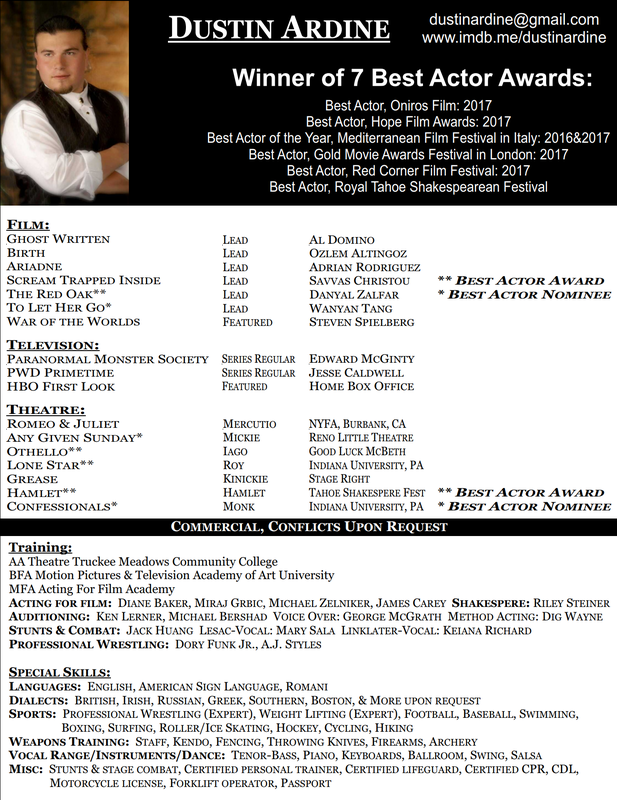 I have just won my 8th "Best Actor" Award. I act both on stage and screen. I believe 100% in who I am and what I can do and I take my craft very seriously, having been classically trained as a true method actor. I put everything I have into each and ever role I am trusted to undertake. As an actor, I am there to help bring the director's vision to life, as well as bring my own creative input to the projects I am involved with. I also sing, dance, and am available for voice over acting as well. Please see my resumé for the details of my experience and skills. I have just wrapped production of a feature film called "I am not for sale" where I play one of the male leads opposite stars including soap opera legend Judi Evans, Sean Faris, and Tom Sizemore. The horror film "Birth" that I starred in just premiered at Cannes Film Festival! Also the last feature film I starred in called "Ariadne" has just been released and is currently in the festival circuit now. I am currently filming a pilot for a TV Show called "Angel of Mercy". Next up, I have two feature films I have been cast as the lead for. The first one is called "Proving Ground", which I will star opposite Hollywood starlet Dominique Swain and many others. The other is a feature film called "Religion" which will be filmed in Africa. To hear more of what I am up to, follow me on all my social media platforms which you can find the links to within this website. Copyright © 2018 Dustin Ardine - All Rights Reserved.